Close spaced hole tend to be uniform in size but there are situations where a hole pattern has hole sizes that differ. If the difference in hole size among the cluster of holes is less than 30-50% than the spindle speed can be set to allow drilling the largest hole size without affecting the tool life. Our Recommended Tool Speed Chart can be used as a guide for tooling speeds for standard high-speed tooling in common materials. When the difference in hole sizes is greater than recommended reducing the spindle speed to that for the largest hole will seriously affect the pattern drilling time. The chance for tool breakage with the smaller sizes will also be increased. 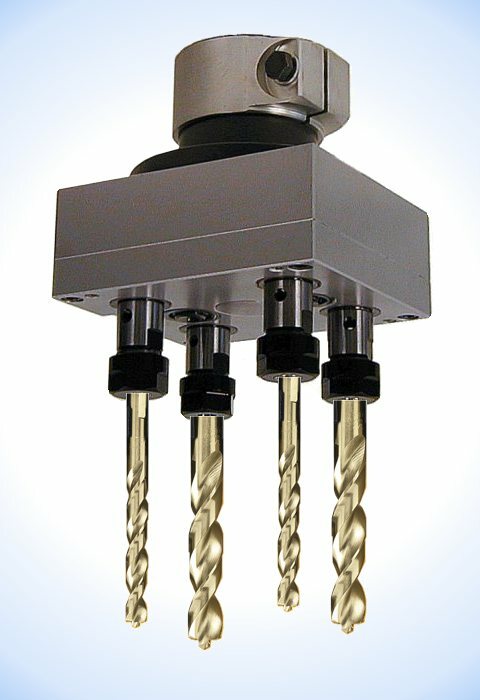 We can provide a solution in the multiple head design to have the spindles drilling the smaller hole to run at a high RPM than the spindles drilling the large holes. This can be done for a nominal charge because of our large selection of gear ratios available.